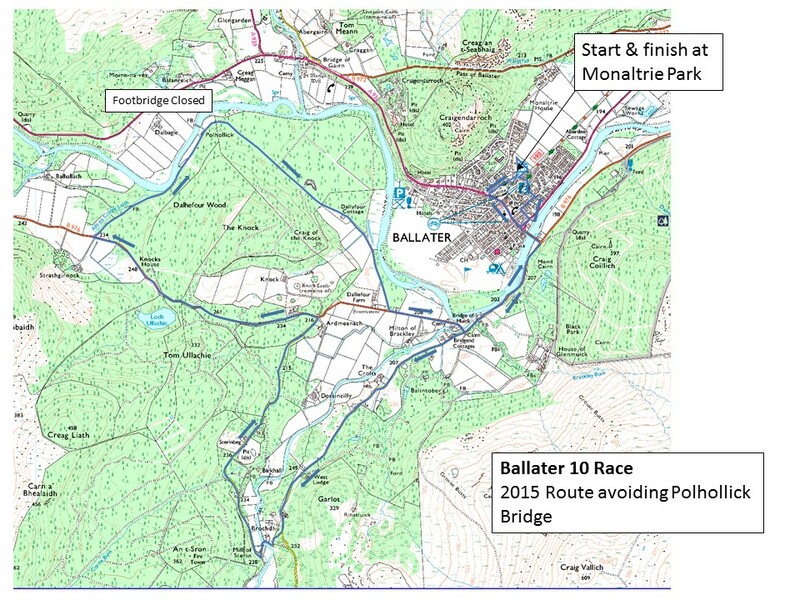 A 10 mile road race through superb countryside around Ballater, Royal Deeside. The Polhollick suspension bridge was damaged in the spate of 30th December 2015 and Aberdeenshire Council will probably not repair it in 2019. So, the route will be the same as last year, see map below. There are two sections where the road or track has been damaged; by the road down to the Muick and the track to the Polhollick Footbridge. At these points there will be short paths through the woods so please take care here. The event is conducted under UK Athletics Rules and is a Scottish Athletics Permit Event. Limited changing facilities and no showers. There will be a water stop at the top of the hill by Knock Castle. Pre-entries, pick up number on day. We aim to hold the prizegiving at 2pm at Monaltrie Park. In 1992 18 runners finished in under 1 hour. Entries online if possible please as this will really help us with race-day admin. Limited entries will be taken on the day, if you really can’t pre-enter. 2009 results click here! Results by category here.